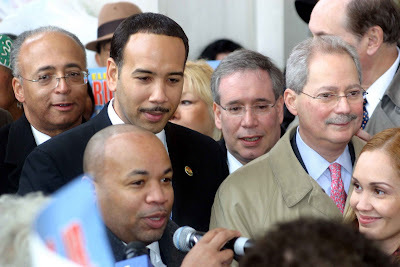 As you can see from the above photo, Ruben Diaz, Jr. (center left), who, for all intents and purposes, will be running unopposed in a special election for borough president, was being swarmed by supporters at a campaign kickoff (coronation ceremony?) yesterday at Borough Hall. At the event, former B.P. Freddy Ferrer (right, pink tie) and new County Democratic Party Chairman Carl Heastie (speaking into the mic) stumped for the 35-year-old assemblyman. Comptroller and mayoral hopeful Bill Thompson (far left) also assured the media that he has Diaz, Jr.'s back. Manhattan B.P. Scott Stringer (wedged between Ferrer and Diaz, Jr.) was also there to support him. Ferrer basically congratulated him on taking over the post he once held. 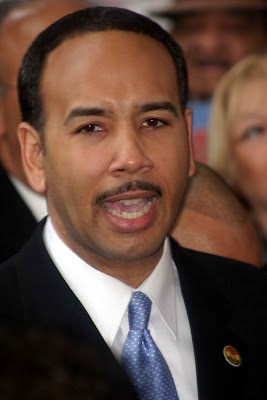 "I've seen Ruben Diaz, Jr. grow in his public service over the years [he became an assemblyman at the age of 23]. I'm happy for him. I'm happy for the people of the Bronx. I think the Bronx would be in very, very good hands." For a while, this looked like it might be a race, but with Councilman Joel Rivera dropping out last week (and Councilman Larry Seabrook reportedly dropping out yesterday), it appears the outcome of the April 21 election is a foregone conclusion. 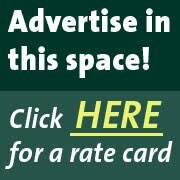 Ladies and gentleman, say hello to your next borough president.